Hello Aspirants, looking for JAG 21 Entry Indian Army Lawyer Recruitment 2018 we have a good news for you soon Indian Army will be recruiting for Lawyer Recruitment 2018. Judge Advocate General JAG entry JAG Entry Scheme 2018 Short Service Commission (NT) Course for Law Graduates. Applications are invited from married / unmarried male and unmarried Female candidates for grant of Short Service Commission in the Indian Army for Judge Advocate General Department. Eligible and Interested candidates can apply online from Indian army official website on or before. For any questions in mind regarding JAG 21 Entry 2017 - 2018 (Men & Women) - Indian Army lawyer Recruitment feel free to ask below in comments. Complete Preparation to Clear SSB. What is seen in candidate at the SSB. How to get screen In for SSB ? Tips to Impress Interviewing Officer at SSB. Tips to Enhance Performance at SSB. Common mistakes committed by candidates at the SSB. Nationality: Eligible and Interested male/female Candidates must be an Citizen of India. Age Limit: Male/female candidates must be born between 21 to 27 years of age. For further details read official notification. NOTE: The date of birth accepted by the office is that entered in the Matriculation or an equivalent examination certificate. No other document relating to age will be accepted and no subsequent request for its change will be considered or granted. Educational Qualification: Candidates must have been passed with minimum 55% aggregate Marks in LLB Degree (three years professional after graduation or five years after 10+2 examination). The candidates should be eligible for registration with Bar Council of India/State. Candidate should be from a College/University recognized by Bar Council of India. ONLINE APPLICATION WILL OPEN 2018 ON AT AND WILL BE CLOSED ON 2018 AT 1700 HRS. 1. Eligible male/female candidates shortlisting of applications will be done by Recruiting Directorate, Integrated HQ of MoD (Army) and the decision of DG Recruiting will be final. Details of the shortlisted online applications will be put on the website www.joinindianarmy.nic.in. In this regard, no representation will be entertained. 2. Short listed candidates will be called for SSB interview at Bhopal, Bangalore or Allahabad Feb/Mar onward. 3. SSB interview is conducted for five days. 4. Recommended candidates would undergo medical testing lasting 3 to 5 days. 5. Selected candidates will be detailed for training at Officers’ Training Academy (OTA), Chennai according to their position in the final order of all India merit, up to the number of vacancies available at the time. 6. Duration of training – 49 weeks (approximately 11 months) at OTA, Chennai. On successful completion of which candidates will be granted commission in the rank of Lieutenant. 7. Candidates will neither be allowed to marry during the period of training nor will He/ She be allowed to live with parents/Guardians. Candidates must not marry until they complete the full training at OTA, Chennai. A candidate, who married subsequent to the date of his/her application though successful at the Services Selection Board interview or medical examination, will not be inducted for training. A candidate if he/she marries, while under training, shall be discharged and will be liable to refund all expenditure incurred on him/her by the government. 8. Training at OTA, Chennai is at Govt. expense All candidates who successfully complete Pre-Commission training at OTA, Chennai will be awarded “ Post Graduate Diploma in Defence Management and Strategic Studies” by University of Madras. 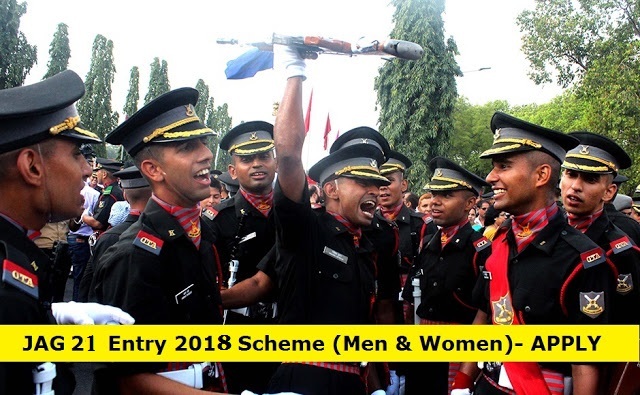 Candidates applying for JAG 21 entry 2018 must be physically fit according to the physical standards of Indian army. The guidelines for the same are available at official website of Indian army Directorate General Recruiting www.joinindianarmy.nic.in. Aspirants can checkout for further details or can ask below in comments for any questions. Candidate recommended by the Services Selection Board (SSB) will undergo medical examination for 3-5 days by a Board of Service Medical officers. Only those candidates will be admitted to the academy who are declared fit by the Medical Board. For further details kindly check official website of Indian army Directorate General Recruiting www.joinindianarmy.nic.in or can also ask below in comments. 1. Candidates eligible and interested have to fill online Applications for JAG Entry from Indian army official website “www.joinindianarmy.nic.in”. 2. Now Open the website “www.joinindianarmy.nic.in” .Click on ‘Apply/Login’ and then click on ‘Registration. 3. Follow all the instructions for registration. And after registration, your profile will open. Click on ‘Apply Online’ to further process. 4. Your registration details will confirm your eligibility to apply and proceed with the application as per onscreen instructions. 5. Before submitting the application carefully check all the entries entered and save the application. 6. After submitting, take two copies of the printout and the Roll Number generated by the system for further use and keep them safe with you. This was all about JAG 21 Entry 2018 Scheme . Eligible and Interested Candidates can apply online for the JAG entry 2017 from the Indian army official website. Candidates can also subscribe us to get all latest updates direct to email I'd or can follow us on Facebook for latest notifications. Feel free to ask below in comments regarding JAG 21 Indian Army 2018 entry.